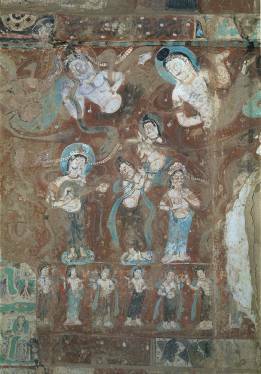 It is one of the oldest caves in Mogao and has survived for more than 1,500 years. 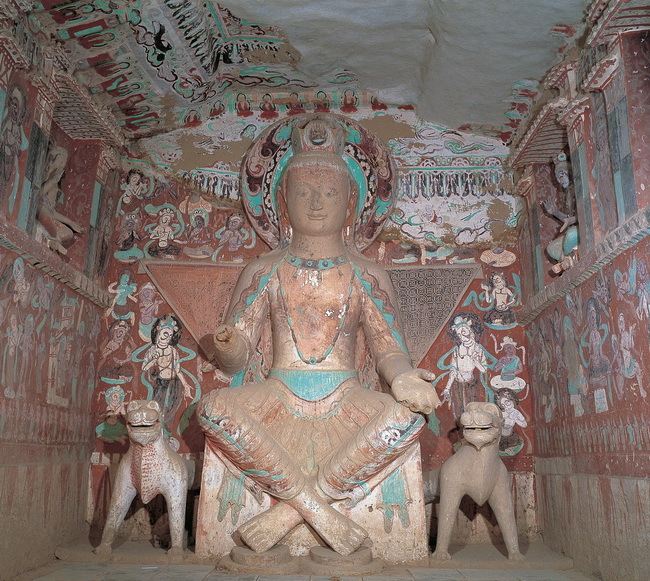 Although this cave is tiny, it has a relatively large statue in front of the main (west) wall; nevertheless, the proportions are harmonious (Figure 1). This main statue, 3.4 metres tall, is the largest of the early period. It is a Bodhisattva identified as Maitreya, the future Buddha. He has a round face, a robust physique and a calm expression. The handsome face has very long ear loops, straight nose, contoured lips and lightly protruding eyes, which are looking down compassionately on the visitor. Wearing a crown containing three round jewels (with a Buddha in the centre jewel), he sits cross-ankled. His sitting pose and decoration, as well as the triangular brocade-patterned backrest, suggest influences from Central Asia. Statues of Maitreya are dressed either as a Bodhisattva (i.e., in the form of a nobleman, since the historical Buddha Sakyamuni was born a prince) or as a Buddha (in the form of a monk). The worship to Maitreya in China reached its zenith between the 5th and the 6th centuries, especially in the north. The cross-ankled sitting pose is the most popular among his statues of that time. The pair of lions flanking him do not appear convincing since the artists (mostly from central China) had not seen a real one and depicted them according to others’ descriptions and their own imaginations. On the upper part of both the north and south walls are three niches. The inner two on each wall are carved in the traditional Chinese building style — each has a gateway with a central tiled roof flanked by towers (known as que in Chinese) (Figure 2, top). Inside each niche is a Bodhisattva seated cross-ankled. Que were popular until the Han dynasty (the 3rd century) for palaces and royal tombs, but few examples are found now. They are moulded and painted with details in Mogaoku. It contains very precious information on the history of Chinese architecture. In the third niche (not shown in the figure) on both walls near the entrance is a Bodhisattva in a pensive pose. These two niches are decorated in Indian style, with spreading branches of two trees on its arched top. 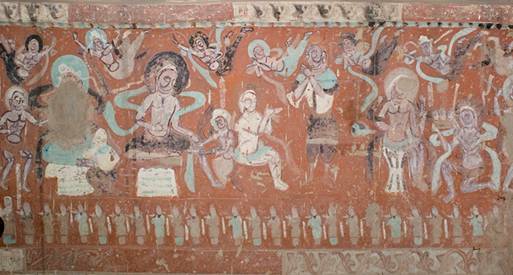 Since the original front wall had collapsed, in the Northern Song (960-1127) a partition wall (Figure 2) was built to provide some protection, and a new layer of mural was painted on the ceiling and part of the walls. This partition wall was removed in the 1990s, revealing the original layer (Figure 3). Another part of the mural was also damaged by the construction of a hole in the Qing (1638-1911) used for the convenience of walking to the adjacent cave. The hole is now filled (Figure 2, left). Murals in this cave illustrate the Buddhist stories. Each of them consists of several episodes within a single rectangular space, with multiple depictions of the same person to represent different times and places within the same scene. The dominant figures in all scenes are always larger in scale. All the figures are dressed and decorated in Central Asian style. The imported Indian colour shading technique (yun-ran) was employed, but the red or reddish brown has oxidized and turned to dark grey, and the white highlight has become off-white on the human faces. Generally in the Buddha’s Life Story, there should be Four Encounters (Prince Siddhartha encounters an old man, a sick person, a corpse and a mendicant monk). Here, on the south wall, only the first and the last were depicted to imply them all (Figure 2, middle register). From the first three, the young prince is aware that life is impermanent so it causes suffering, while the fourth sets out a path for liberation. Below the Buddha’s life story is a row of Bodhisattvas. They have nimbus and stand on lotus (see Figure 2, same height as the lion head; and Figure 3, bottom). Of the five jataka tales depicted on the north wall, the most famous are that of King Sivi (who offers his flesh — his whole body — as ransom to save a dove’s live from a hawk) (Figure 4, left) and King Candraprabha (who even gives away his head a thousand times in his thousand lives) (Figure 4, right). The third king can tolerate his body to be used for lighting a thousand lamps; the fourth has a thousand nails nailed into his body, and the fifth gives away his eyes. These tales all signify self-sacrifice — especially of the physical self. The subject of these murals illustrates the message that achieving enlightenment requires toleration of pain and the sacrifices of self. 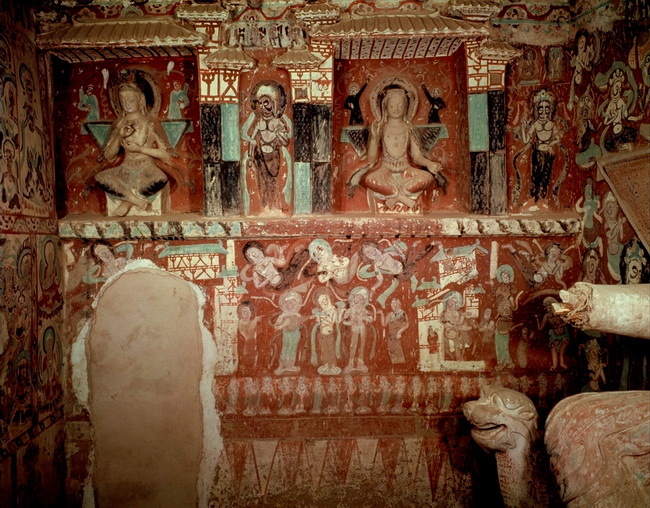 Some scholars suggest the composition of this cave depicts Buddhahood in the past (with jataka on the north wall), the present (with Sakyamuni’s life story on the south) and the future (with Maitreya in the centre). Below the jataka tales on the north walls is a row of 33 donor images. These men, 18 cm high, are clad in nomadic riding dress (Figure 4, bottom). All of them are shown in three-quarter view, lining up behind one another and facing in the direction of the procession. They hold a softly bent flower in their raised hand. A monk, who is taller than the others by a head, leads with an incense burner. There is no inscription to reveal information about these donors’ names and their ranking. According to their costumes, some suggest they belong to the Xianbei tribe who were active patrons at the time. Later in 439, Toba clan of the tribe founded the Northern Wei dynasty.